Who doesn’t love a big slab of chocolate? My favourite chocolate bar of all time has to be a good old fashioned block of Cadbury Fruit & Nut (followed closely by whole nut!) – you just can’t beat it! Creamy, comforting, chewy and crunchy, it’s just a real winner for me and a serious go-to if I’m ever feeling down…or happy…or hungry…or anything! But hold your chocolate horses, Cadbury is giving us a chance to INVENT a brand new favourite! #Gomadbury for their new competition and actually win the chance to get your chocolate invention made into a real life bar and sold in the shops, how cool is that?! There’s over 90,000 combinations with all those delicious (and sometimes strange!) ingredients to choose from, so it’s not going not be easy to make that perfect bar, but I’m gonna give it a go…pass me my apron! Pistachio – This little green nut has always been one of my favourite flavours after tasting pistachio ice cream for the first time on a family holiday to Italy when I was little. It’s subtle but I find there’s nothing that tastes quite like it! Lychee – And for a bit of fruit, the Lychee. Again a subtle but sweet flavour that tastes like nothing else, I love them in a cocktail or with some ice cream in the summer, they look a bit strange but they have such a yummy flavour. So we’ve got fruit, and nuts…this is sounding pretty familiar! Rose – My final flavour is something a little bit different, Rose. It’s one of my favourite smells and ingredients in beauty products as it’s great for calming you down if it’s burned in a candle, but also fab for caling down irritated or inflamed skin in your moisturiser too! Rose is just a general all round feel good scent and it’s such a delicate taste too which will go wonderfully with the pistachio and make it stand out a little! 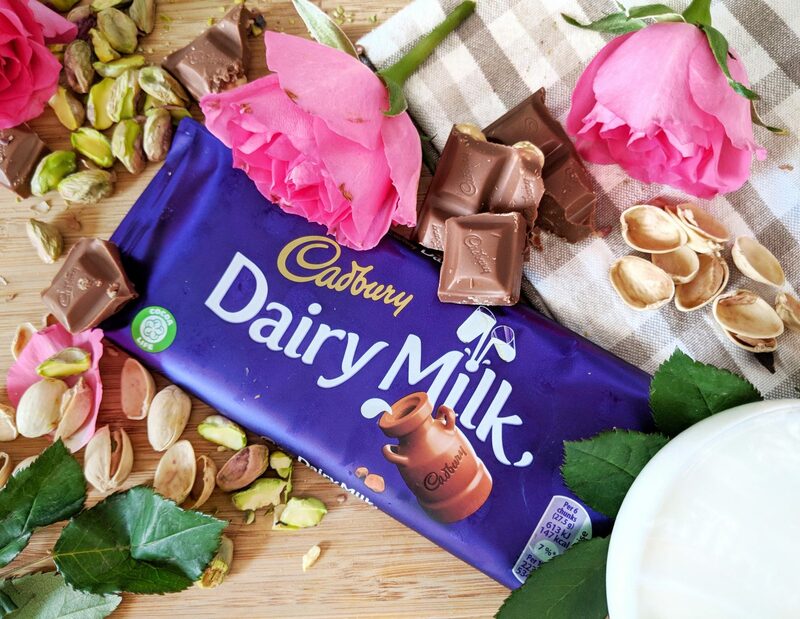 So there we go, my ultimate chocolate bar – a delicate and floral grown up version of the traditional Cadbury Fruit & Nut…I shall call it The Cadbury Dairy Milk Floral & Nut! Ok so maybe chocolate invention isn’t my forte and I should stick to blogging. But you guys should 100% give it a go and do us proud! *Paid collaboration with Cadburys. All chocolate bar ideas and opinions are as always, my own. Fingers crossed we win!